Julia Ward Howe relates how she came to write the Civil War hymn. IN the late autumn of the first year of the war for the Union, a strong feeling of interest and of wonder drew me with many others, to the city of Washington, which had become the center of military operations. Bitterly as we deplored the war itself, its features had yet for us the interest of the greatest novelty, and we could not help thinking with romantic enthusiasm of the new and strange sights which we were about to see. These began when we passed the first pickets of our army, which were stationed at intervals along the railroad between Baltimore and Washington. This was on a chill November evening, and the little groups of soldiers seated around a pile of blazing logs made for us a new and attractive picture. Arriving within the city, we found abundant evidence of its military occupation. A number of troops were quartered within it, and small bodies of armed men marched frequently through the streets. Officers and orderlies galloped past the windows of our hotel. Ambulances came and went. Buildings here and there were designated as military headquarters. Quite near our hotel was a ghastly reminder of what was going on, in the shape of an establishment for embalming the bodies of the dead, so that they might be removed to the places designated by their friends for burial. The minds of all were intent upon the war, and no news were asked for other than intelligence of the various skirmishes and encounters which were constantly taking place between our men and those of the enemy. It was therefore with eager interest we made our first visit to the encampment of the great Army of the Potomac, which at that time occupied a great stretch of country in the neighborhood of the city. Provided with a pass allowing us to go and return, we crossed the long bridge, guarded by sentinels, and after a short drive, found ourselves in what looked like a city of tents, swarming with soldiers, and resounding with the notes of the bugle and the tap of the drum. Our first visit was to the colonel of a Massachusetts regiment, stationed at Fort Albany. I remember well the interest with which we inquired into every detail of camp-life; the officers’ tents, warmed by small stoves of sheet iron; the doctor’s tent, provided with a huge medicine-chest; the hospital tent, with its rows of pale, gaunt faces. Our friend, Colonel G————, welcomed us cordially to his headquarters, which were in an ordinary wooden building, with a piazza running along the front. He invited us to warm ourselves by a comfortable wood-fire, and presently called together a number of his men to greet the visitors from Massachusetts, among whom was the wife of its greatly honored Governor, John A. Andrew. From this camp we drove to another and another, and the sunlight had quite failed us before we crossed the long bridge again, and returned to our hotel. A little after this, we drove out again to attend a review of ten thousand of the national troops. While this was in progress, a sudden alarm intervened. A small body of men had been attacked and surrounded by the enemy. We saw the re-inforcements gallop to their assistance, and presently learned that the review would be discontinued. Our way back to Washington was by the road over which the troops which had gone out for the review were obliged to return to their cantonments. They filled the whole space like a river, in which our carriage moved slowly along, the horses walking not faster than the men walked. To beguile the time we began to sing the John Brown song, which was at that time very popular among the soldiers. As we sang it they answered back, ‘Good for you.’ I remarked to a friend that I had always wished to write some verses which might be sung to that tune. Accordingly I sprang out of bed, and fumbled about in the dark room for a stump of a quill pen and a bit of paper which I remembered to have seen upon my table before retiring to rest. I had acquired the habit of writing without using my eyes, through a sort of necessity, having often had occasion to record some sudden thought in the dark chamber in which my own baby might be lying asleep. This habit now stood me in stead, and although what I wrote was very crookedly written, I knew by past experience that I should be able to make it out within twenty-four hours of the time in which it was written. 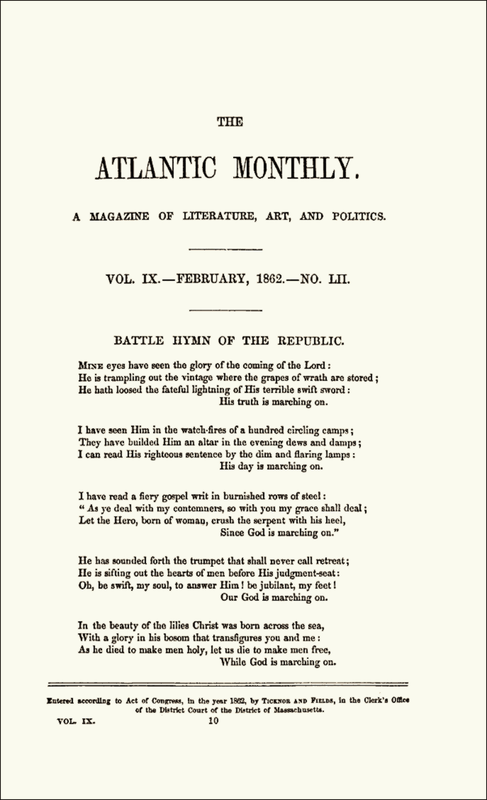 The poem was published in the Atlantic Monthly magazine. Mr. James T. Fields, at that time the editor of the magazine, suggested the name by which the verses have become known. Its appearance at first excited little comment, and I had ceased to think of it as likely to be especially noticed, when I read in some newspaper that a number of Union men shut up in a Southern prison had found some comfort in singing this new hymn, whose author was unknown to them even by name. This name was now inquired for and made known. In the many years which have passed since that time, I have often had the pleasure of knowing that my battle-hymn has been sung by the [lovers of God and men. I learned, years ago, that at a great meeting of the colored schools of Richmond, Virginia, it was sung by a large chorus of children, teachers and parents. In our far West, I have been greeted by its music as I have walked to take my place on the platform. I have heard it in the far East, also. When on a visit to Constantinople some years ago, I had the pleasure of passing some hours at Robert College, an American institution, beautifully situated on the banks of the Bosphorus. As I was about to take leave, the professors and ladies who had kindly entertained me asked me to listen to what I should hear while descending the steep hill upon whose summit the college stands. – I had been carried up this ascent in a chair by two stout porters. As I walked down, helped only by one strong arm, I heard the voices of my late entertainers united in singing, ‘Mine eyes have seen the glory of the coming of the Lord.’ And I thought that we might see this glory oftener if we would look for it, and most of all where faithful souls are working together for the good Of humanity. —Julia Ward Howe, Youth’s Companion. Battle Hymn Of The Republic, Jim Nabors.